Recorded as from Massachusetts. 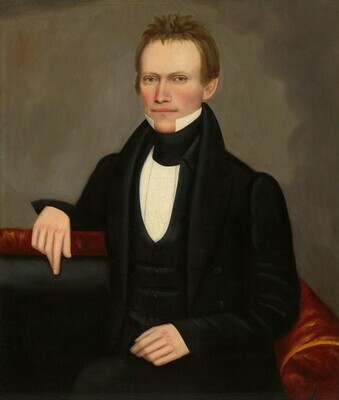 Descended in the family of the sitter to Drewville Jeffery, whose wife was a descendant of the sitter. (John Esposito, city unknown), by whom sold in 1964 to Edgar William and Bernice Chrysler Garbisch; gift to NGA, 1971. Between the Rivers: Itinerant Painters from the Connecticut to the Hudson, Sterling and Francine Clark Art Inst., Williamstown; Mus. of Fine Arts, Springfield, MA, 1990-1991, no. 28 (not shown at third venue, Hudson River Mus. of Westchester, Yonkers). American Paintings: An Illustrated Catalogue. National Gallery of Art, Washington, 1980: 160, repro. American Paintings: An Illustrated Catalogue. National Gallery of Art, Washington, 1992: 179, repro. Chotner, Deborah, with contributions by Julie Aronson, Sarah D. Cash, and Laurie Weitzenkorn. American Naive Paintings. The Collections of the National Gallery of Art Systematic Catalogue. Washington, D.C., 1992: 119, 122, color repro. 121.